Editorial Offices: 222 West Pleasant Dr.
No advertising accepted unless from member cooperatives. 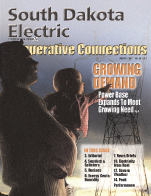 South Dakota Electric Cooperative Connections and its 31 sister publications are read in more than 100,000 homes in South Dakota and western Minnesota. Each cooperative in South Dakota, plus three in Minnesota, produces its own version of the magazine.